Scottish Country 'Dancing' (Ceilidh) Lessons Week 3. You must be a member of the Edinburgh City Trotters Group to attend this activity. Would you like to join this group? 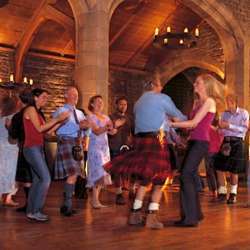 There will be 3 × 2 hour sessions on the nights of Monday Sept 3rd, 10th and 17th by which time we are confident that all attendees will have managed to learn 7 of the main and most popular reels that are danced at ceilidhs, highland balls, etc. The 4th Monday (24th) will then be an InterNations “aye-pad Ceilidh” and you will dance all of the 7 reels. Dress code: casual and whatever is comfortable for dancing, I recommend taking water and a hand towel.